Oh my goodness. By far the best outlet mall I have ever been to, the Orlando Premium Outlets totally blew my mind on full day #1 (Sunday) of this trip, when I was still feeling super under the weather. I was determined to not waste a SINGLE day in Orlando though. If I couldn’t enjoy premium eats, I could at least enjoy premium shops! 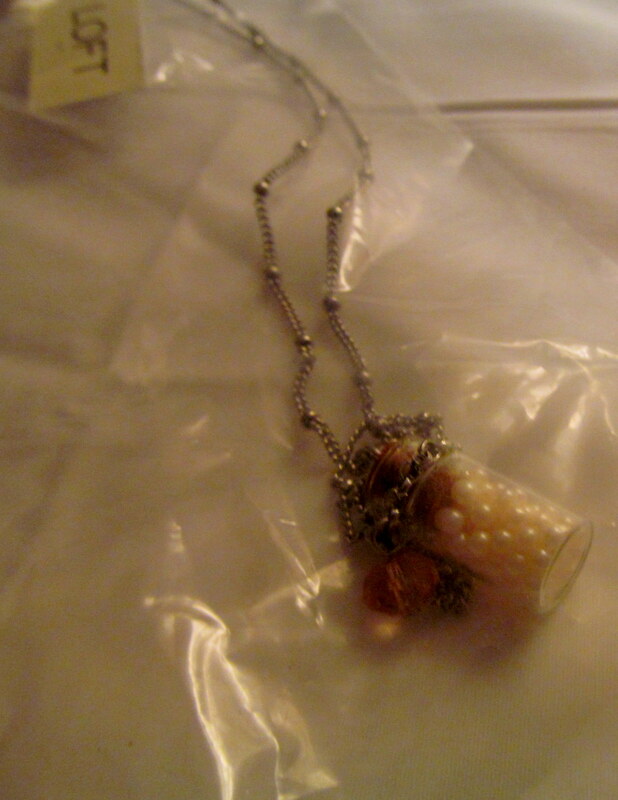 Purchased the above two necklaces at Charlotte Russe, 2 for $10 and then got 15% off for having a college ID, score! 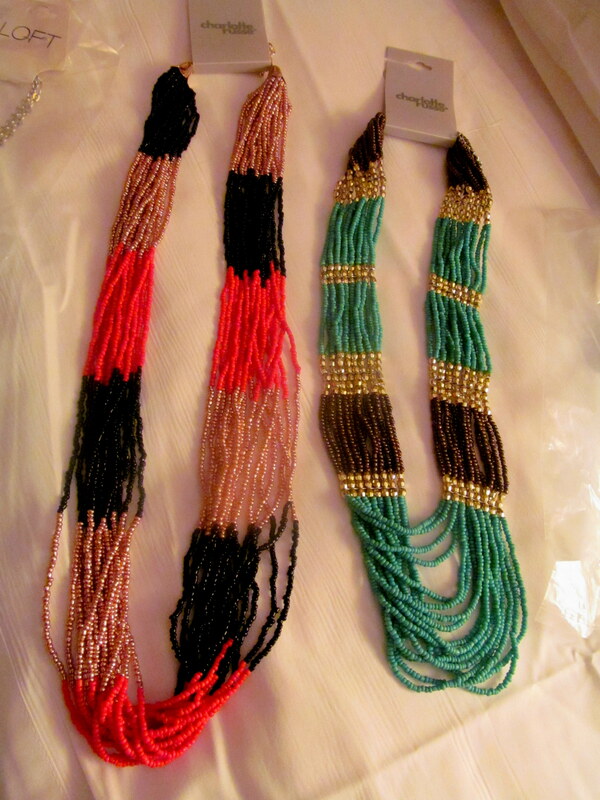 Two more necklaces from Ann Taylor Loft, buy one, get one 50% off. They look kind of weird all folded up in their cellophane bags, but I like how the cashier placed them in there and stapled the bags shut, so I’m keeping them there until I can unpack them at home. Lighting makes this J. 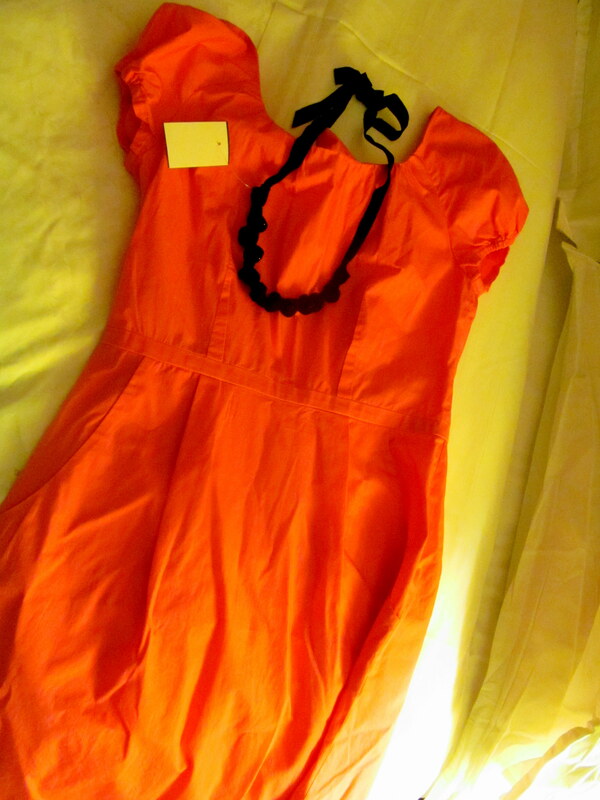 Crew dress look more coral, but it’s actually bubblegum pink and has one of those exposed zippers in the back. I tried to find a more telling photo online but couldn’t! 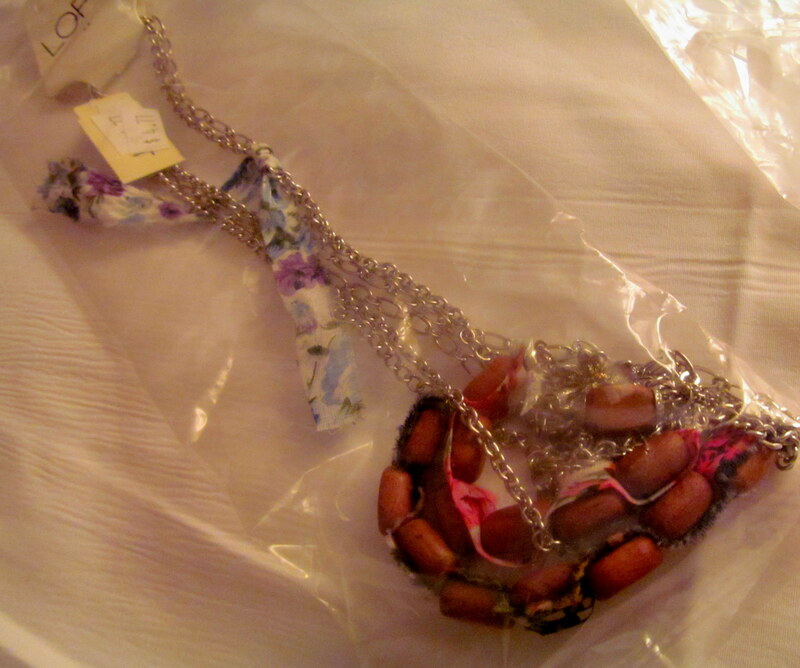 This necklace was only $5 and J. Crew has a student discount too! Ahhhh Vera Bradley outlet!!! 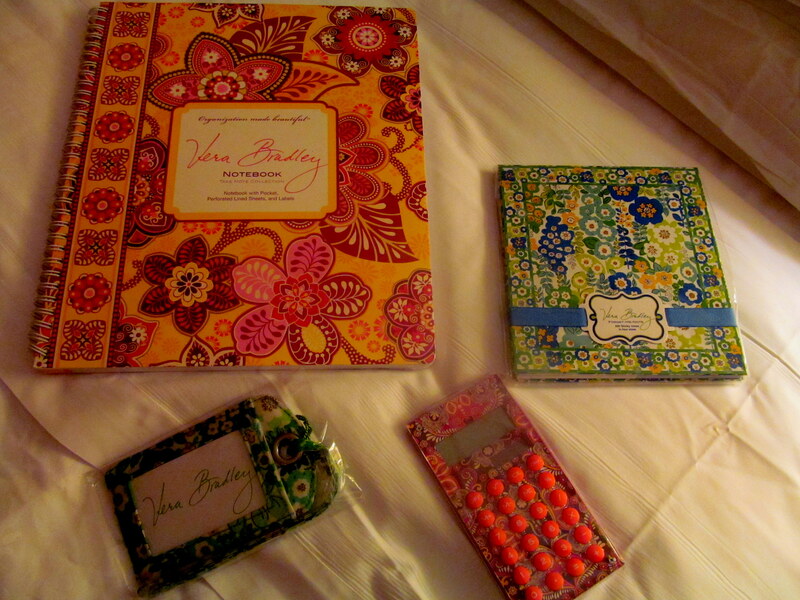 I used the opportunity to purchase several Vera items I’ve always wanted but haven’t been able to justify purchasing – another notebook for school, sticky notes in assorted sizes, a calculator for my desk at work, and a luggage tag. The outlet prices were an additional 20% off! As if I need any more shoes, right? 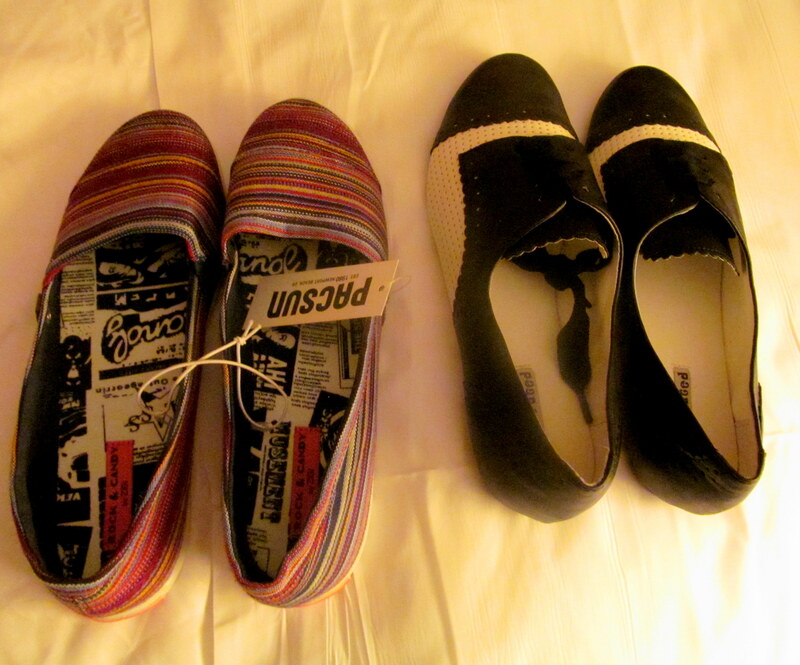 I got some Toms look-alikes at Pac Sun, because I am in love with the ones I got in Boston but too cheap to pay $54 for another pair. 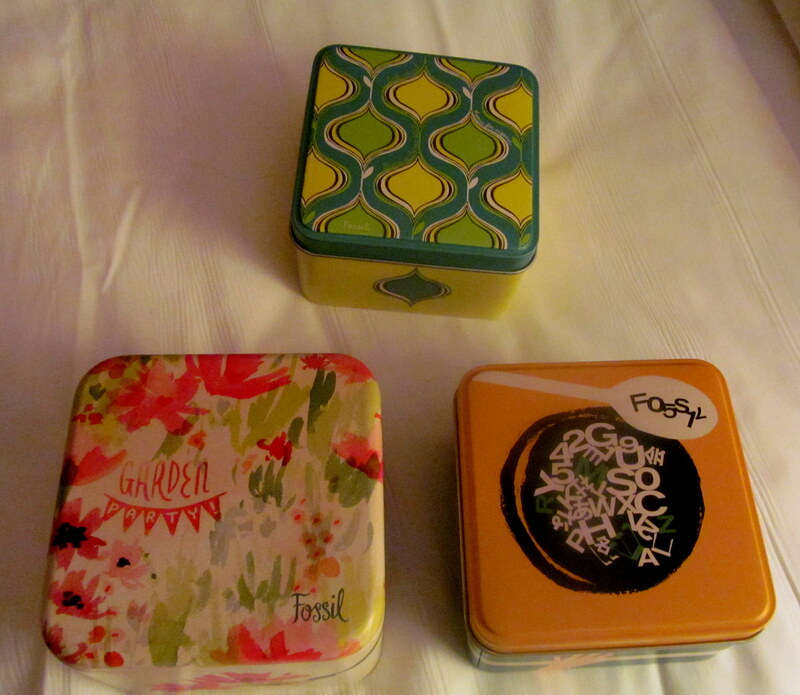 I am more in love, though, with the pair on the right that I got at Journey’s. I have been wanting black and white 20’s-inspired shoes for awhile and am so happy to have found some that were reasonably priced – and I got 15% off from a coupon! At Pac Sun I also got the above cloth leopard-print tank dress. It’s so comfortable and such a simple cut. The design also has a cute criss-cross back that’s unexpected if you just look at the dress from the front! I like the leopard print – I can even dress it down if needed with a black cardigan. I’m also excited about the bikini I got because I’ve always wanted one with a “sculpted” triangle top! 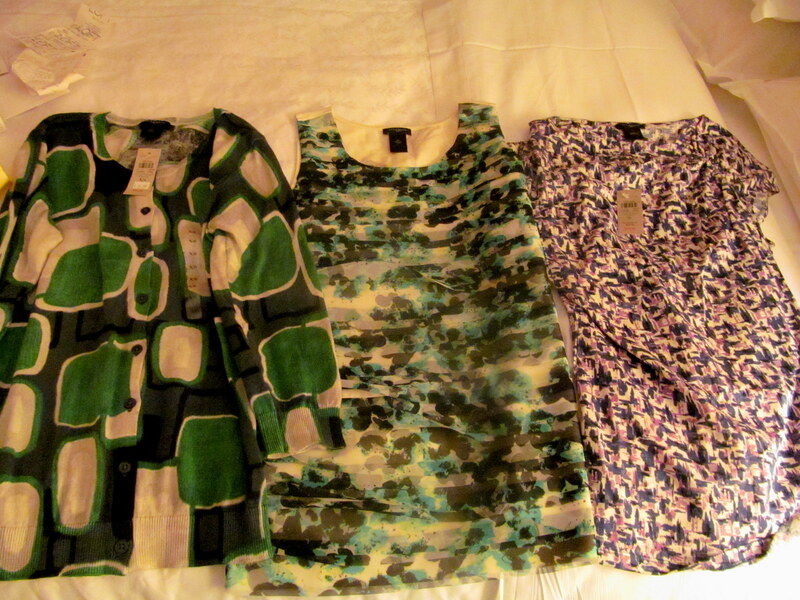 I really like the prints that Ann Taylor comes out with every season. I have always been a fan of prints over solids (though there’s a time and place for everything!) and now that I have the above three tops, my next mission is to find some of the amazing colored ankle-length pants that have been all over the fashion mags lately. 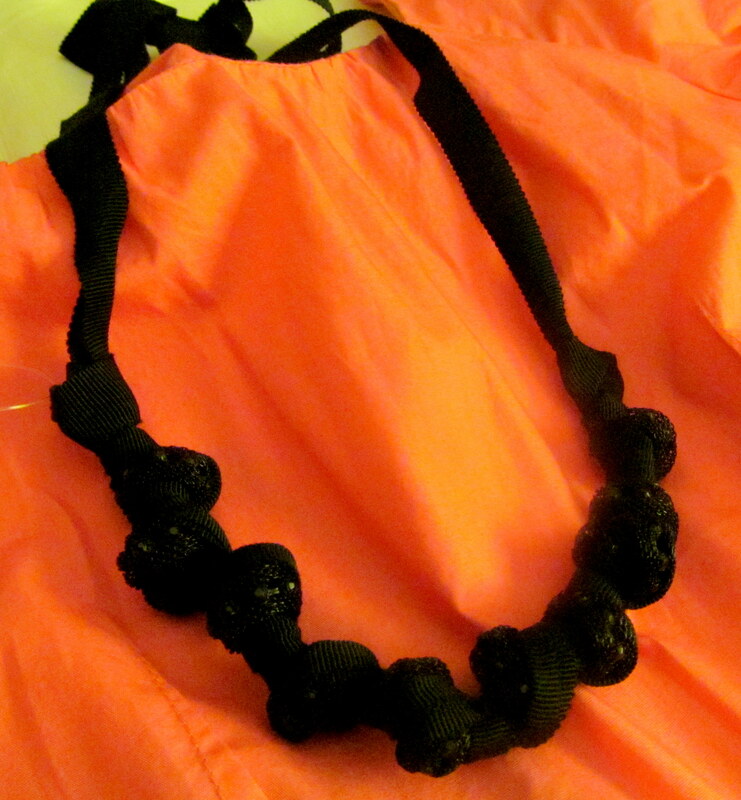 Drumroll please, my biggest and most ridiculous/spontaneous purchase of the day – and ever. I am a watch addict, so strolling into Fossil on a whim (I originally was headed to Auntie Anne’s, but alas, the damn line was out the door) was probably a big mistake. I immediately spotted several watches I’d had my eye on for awhile. Okay that’s a lie, two of them I’ve had my eye on, one I just saw and became enchanted by it. It reminded me of, oddly enough, birthday cake. Do you see what I mean? That teal face (it’s more green in “real life light”), those colorful rhinestones. 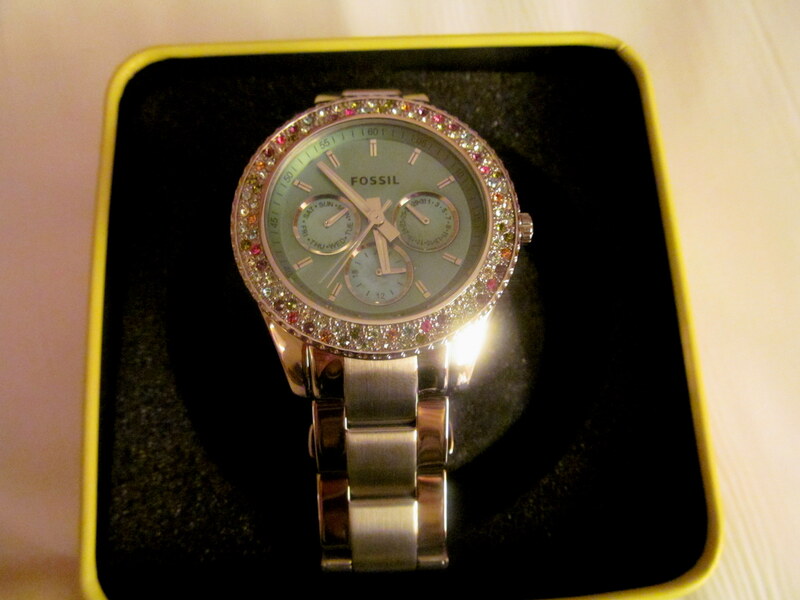 This is a total birthday watch! 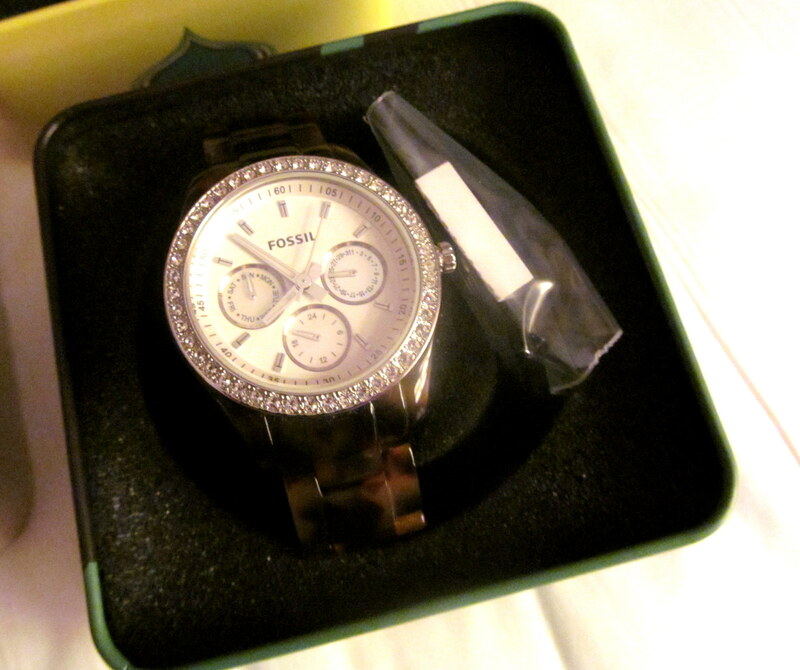 My sister got the above watch for Christmas, and I was instantly jealous. Now I can say I have my own! 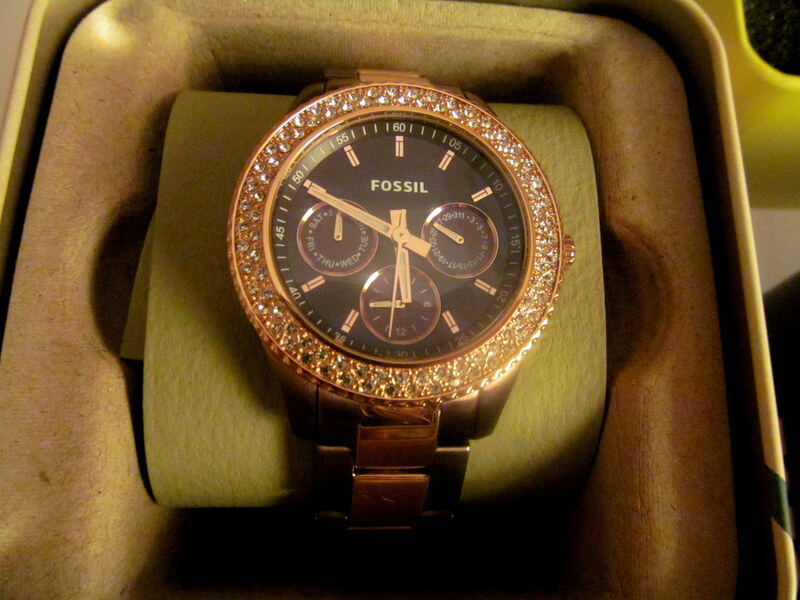 I saw the above watch, brown with a rose-gold stripe, online several months ago. I fell in love! It was even more beautiful in person. 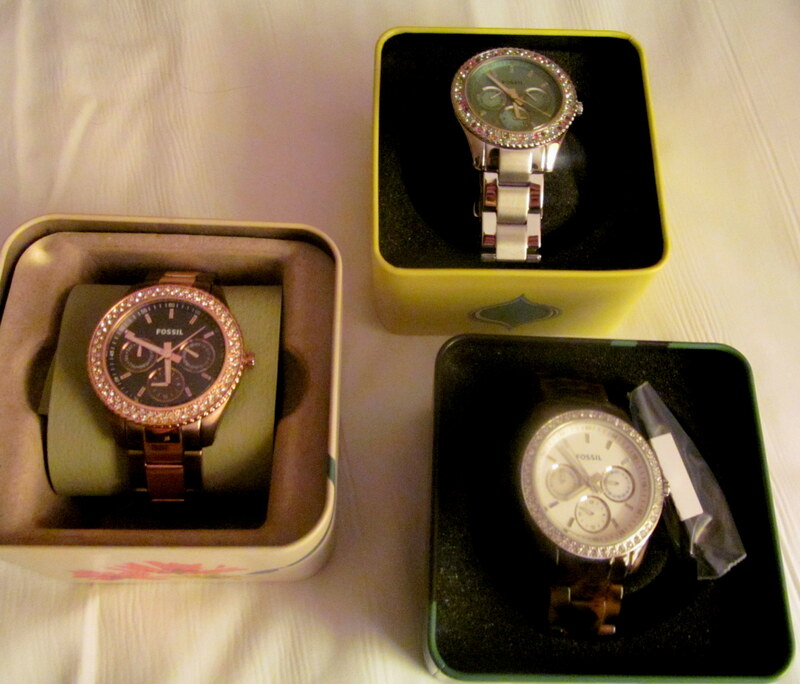 Yes…I bought all three watches. AHHH. I was so afraid that the salespeople were judging me – ha! I was nervously chatting with the girl who helped me try on the watches, trying to make sure that there were people out there who had bought more than three at once before to calm myself. I am never this spontaneous and I don’t do things like this often…and I’m pretty excited about my watches…but it’s safe to say I won’t be going shopping again for awhile. So all this shopping definitely cheered me up a bit, but I still went into the evening feeling sick, especially after being on my feet at the outlets for about four hours straight! My dad and I picked up takeout from TooJay’s and I was able to eat some of it (see above). What’s the most spontaneous purchase you have ever made? What do you think of my purchases? What’s the best outlet mall you’ve ever been to?